In Seattle, the Seahawks are king. That means the Seahawks logo is everywhere you turn– on shirts, hats, flags, cars, and even on the side of buildings. The list goes on and on. 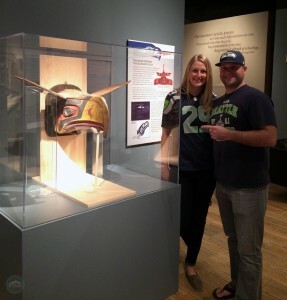 That’s why Tim and I headed over to the Burke Museum when we found out the Native American mask that inspired the Seahawks logo is on display. But be warned, it’s only here for a limited time. Here is Tim’s Seahawks hat to use as a comparison to the mask. 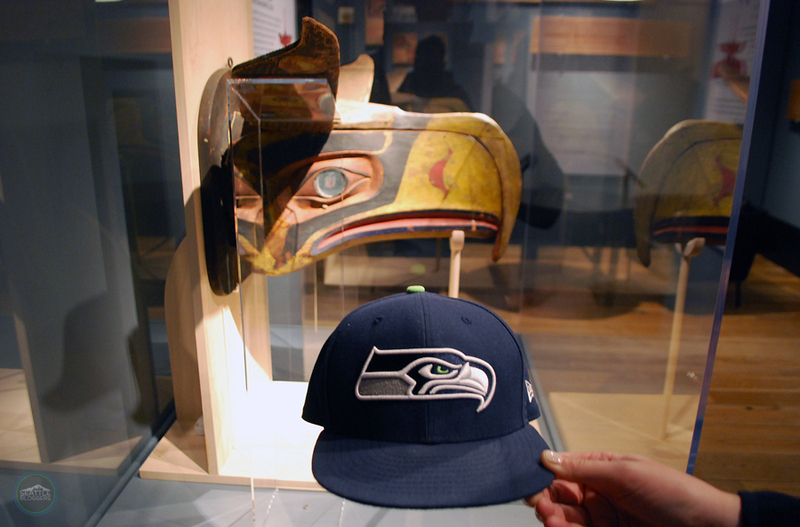 In the lead-up to the 2014 Super Bowl, the awesome folks at the University of Washington’s Burke Museum started researching the story behind the Seahawks logo. It wasn’t long before they found a black and white picture of a mask that looked nearly identical to the logo. A front view of the mask. It turns out the NFL commissioned a logo for the newly formed Seattle Seahawks in 1976 and the logo designers were inspired by Northwest coast art, specifically this mask depicting an eagle. There was one problem though, the Burke Museum had a picture, but they weren’t sure where the mask was actually located. Luckily, their blog post went viral and in no time at all a museum in Maine contacted the Burke saying they had the mask. After a successful Kickstarter campaign, which was supported by the faithful 12th Man, and lots of careful planning, the mask made its way to Seattle and is on display at the Burke Museum through July 27, 2015. 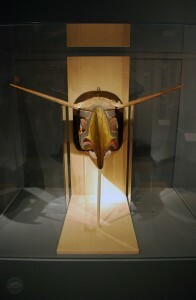 Since arriving in Seattle, the Burke Museum has learned even more about the mask. It was carved in the late 19th century by members of the Kwakwaka’wakw tribe, located on Vancouver Island. Masks like this one are used in dance and typically tell the story of a family, or a family member’s super-natural encounters. The mask also opens up, revealing the face of a man. Tim and I with the mask. Tim and I loved seeing the mask that inspired the Seahawks logo in person. The Seahawks have become such a big part of the Seattle culture and to get an up-close look at the mask gives you chills. It’s also a really beautiful piece of Native American art. Even though the Seahawks logo has undergone a couple of changes since the 1970s (one in 2001, and another in 2012), it is still very similar to the mask on display. 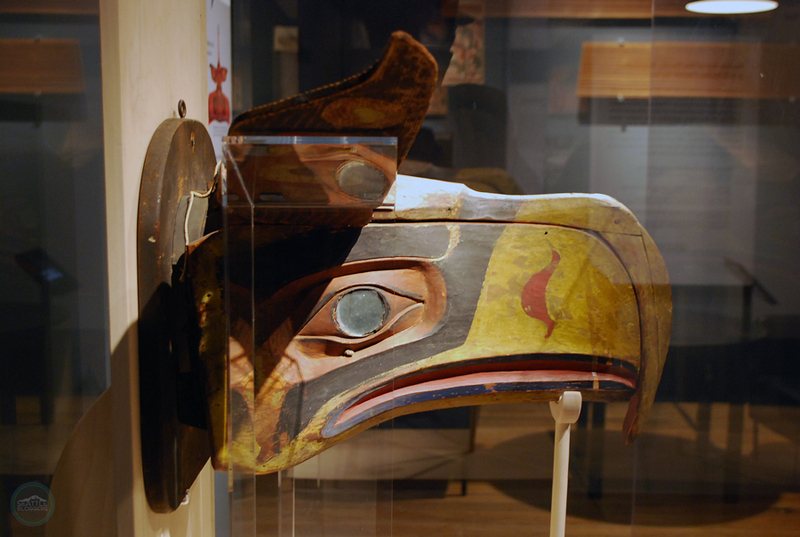 If you’re a Seahawks fan, or a fan of Pacific Northwest history, we recommend checking out the mask before the end of July. We also recommend walking through the entire museum during your visit. It is filled to the brim with other amazing artifacts from the Northwest and beyond. Pro Tip: Parking at the Burke Museum is free on Saturdays after noon and all day Sunday. Also, admission to the museum is free on the first Thursday of each month. Have you checked out the mask that inspired the Seahawks logo at the Burke Museum? What did you think of it? We’d love to hear from you. Please leave a comment below or connect with us on Twitter, Facebook, and Google+. Don’t forget to also check out Seattle Bloggers for more great places to visit in Seattle. 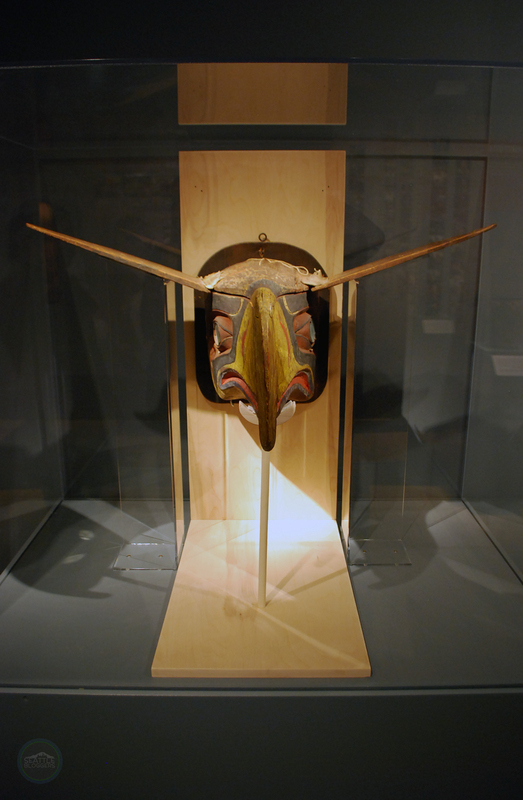 The Native American mask that inspired the Seahawks logo.